The last decade of Hunt's career saw him win some outstanding commissions. Partly, these opportunities arose due to exceptional funding made available in celebration of the millennium; partly they reflected Hunt's lifelong gift for forging links with like-minded collaborators. Hunt's former student at the Royal College of Art, the inventor and industrial designer James Dyson (1947-), became (and remains) his friend at a time when Dyson was looking for new premises. Hunt suggested architects Wilkinson and Eyre for the job of converting the existing factory building at Malmesbury, Wiltshire, that would become Dyson's HQ. With commissions for work at The Eden Project near St Austell, Cornwall, and the National Botanic Garden of Wales in Camarthenshire, Hunt took his place in the great British tradition of glasshouse design and construction, which had design sources in Paxton's Great Conservatory at Chatsworth House and Decimus Burton's Palm House at Kew Gardens in London. 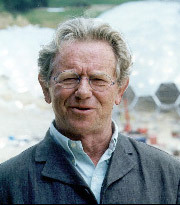 Crucial to Hunt's work during this period was the development of computer modelling software; without it, Hunt has said, it would have been impossible to design the Eden Project's huge biodomes. Working with Nicholas Grimshaw & Partners, Hunt helped design a system of batch-produced components (manufactured by Mero Structures) that joined to form the biospheres. These are the largest plant houses in the world. Hunt has claimed that the weight of the structure is less than the weight of air contained within. This triumph of engineering owed much to the vision of the project's founder, Tim Smit, with whom Hunt struck up an immediate and lasting friendship. Another glass-roofed plant house building is the National Botanic Gardens of Wales (2000). A vaulted arched roof with hemispherical ends crowns a glasshouse of crisp geometric form, in concept similar to Ralph Freeman and Ralph Tubbs' Festival of Britain Dome of Discovery (1951). Hunt must have felt some regret over the 1994 abandonment of the Centre du Conférences Internationales de Paris (CCIP) project. The competition-winning design (helmed by architect Francis Soler) was planned for a site near the Eiffel Tower. It comprised three rectangular glass halls, each of 50m clear span, 150m long and 35m high. Comparisons to Paxton's Crystal Palace (1851) would have been inevitable. Anthony Hunt retired in 2002 at the age of 70, assigning his professional interests to SKM, an international multidisciplinary engineering company with roots in Australia. He remains a consultant to SKM Anthony Hunts. After retiring, he moved briefly to a farm in Gloucestershire with Diana. When his third marriage (of 22 years) ended in 2007, he returned to the familiar surroundings of the Cotswolds, where he now lives. The domed structure of the National Botanic Garden of Wales (completed 2000). National Botanic Garden of Wales. Model of the three rectangular glass halls of the proposal for the Centre du Conférences Internationales de Paris.